More photos from our walk along the Seine on Sunday. 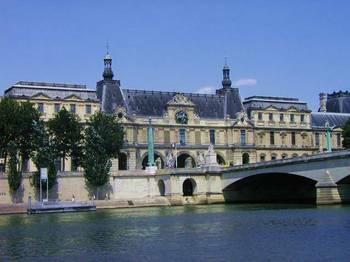 The place at left is on the ile Saint Louis. 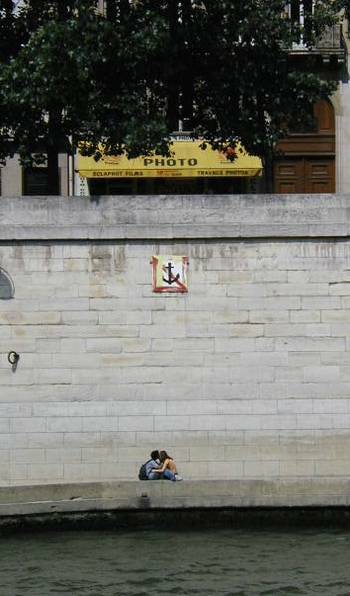 Anchoring here is forbidden, but French kissing is not. In the newspapers, we've been reading about the reform of the retirement system in France. Our friends from Germany, Mareen and Arnold, told us last summer about their system in Germany, which is much like the one in France. From what they told us, we wonder why anyone would ever work very much. It sounded like one would only have to work for a couple months or so, and then one would have a fairly liberal unemployment compensation for 12 months. Then back to work for a couple months, then off for 12 more, etc. I thought that surely I must have misunderstood them. But no, what I read in the papers is much like that. For example, the people on strike now are the "intermittents du spectacle," who the International Herald Tribune euphemistically calls "artistic workers." They are the folks who work, intermittently, putting on shows and arts festivals all over France. 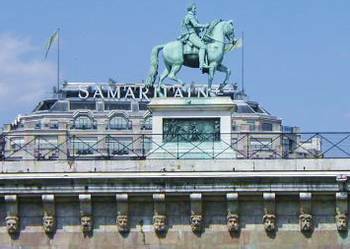 Their strike has meant the cancellation of a number of festivals and shows, including one at the "Comedie Francaise," one of the national theaters in Paris. The deal they had before the reform was that they had to work 507 hours within a 12-month period (that would be 12 and a half weeks at a rate of 40 hours per week). Then they could draw unemployment pay for 12 months. With the reform, technicians would have to work 507 hours in a 10-month period, and then could draw unemployment for "only" 8 months. Musicians would have 10 and a half months in which to accumulate their 507 hours. 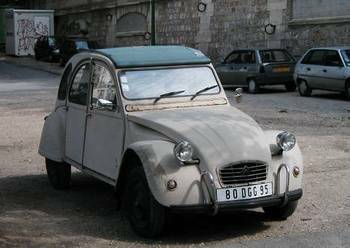 Very old Citroen parked near the Seine. According to the Associated Press, "The changes are aimed at making up a 828 million euro shortfall in the system used to pay arts workers' unemployment." A few different unions represent these workers. One of them, the communist-linked CGT which represents 70 percent of the votes in this category, has not signed onto the agreement and claims that 35 percent of the intermittents may be excluded from the system of unemployment compensation. I suppose this is because they wouldn't be able to squeeze 12.5 weeks of work into a 10-month time frame??? To lessen the impact of the reform, the intermittents will be allowed to work at some other type of job in addition to their "regular" one. Under the current system, that is not allowed. Today, July 1, a number of things change for French families. As of today, if one changes cell phone companies, one can keep one's cell phone number -- no need to change it. Now that's civilized. The government will no longer reimburse people for 650 medications judged to be ineffective or insufficient. Electricity rates will go up 3 percent. Train fares will increase by .5 to 1.5 euros. Minimum wage will increase by 5.27 percent, becoming 7.19 euros per hour. Bank transfers throughout Europe will cost the same as bank transfers within France. Le Figaro says that there were between 500,000 and 700,000 people in the Gay Pride parade that we watched on Saturday. For the first time, the conservative party (L'UMP) was represented in the parade. The representatives of the "gauche" (left) have always participated. 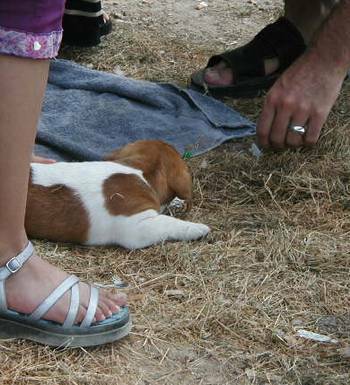 On Sunday, we encountered a family who was trying to sell puppies down on the left bank of the Seine. Here's one of them. 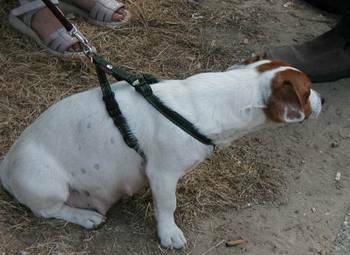 They weren't really old enough to be separated from their mother, so the woman was taking orders from a couple who wanted one or two of the pups when they were big enough. The proud mother, below. A police car pulled up while we were standing there, and the man had to explain to the cops what they were doing. I thought the man might be given a citation for soliciting without a license or something. 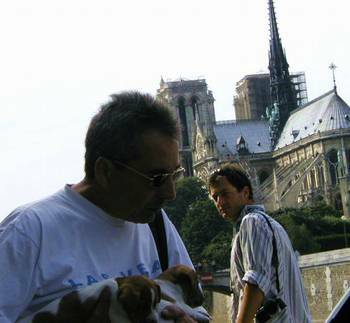 The man talked to the cops (photo at left) while holding two of the pups. After a while, the cop reached out an petted the pups and all was well. We ended our long walk on Sunday with a stroll past the Menagerie at the Jardin des Plantes. 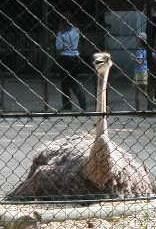 We didn't pay the fee to go in, but we were able to get this nice shot of an ostrich at rest in the hot sun. The Jardin des Plantes is also home to the natural history museum. 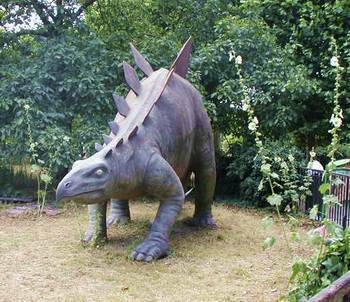 This metal dinosaur lurks among the hollyhocks near the entrance to the museum. 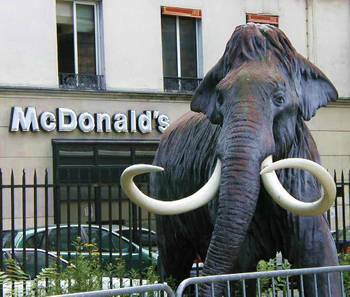 We thought about strolling through the Jardin, but were turned off by an immense amount of litter, much of it coming from the nearby McDonalds guarded by this McMastodon. Perhaps the crowds from the Saturday Gay Pride Parade had left the litter in the park, I don't know. Can anyone tell us what this is??? We've seen it on a couple of different boats on the Seine. 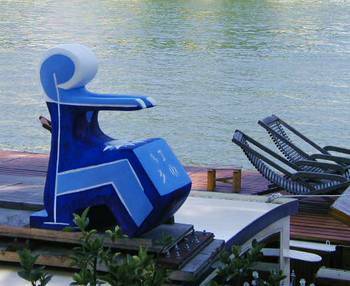 It seems to represent a water skier, but we aren't sure.